This year’s world cup was another thriller. Here in Iceland, we narrowly lost out to Croatia to get into the tournament. The secondary fallback for the office was the USA. Partly due to some of our team having roots there, but also for the Icelandic player who choose to play for the US rather than his main citizenship, Iceland. Fast-forward to 02014 and we’ve got another World Cup on our hands. We dug through the old code repository and updated the values with this year’s teams and goals. Within a few minutes we had our data visualization again. That’s the great thing about doing this in code rather than by hand, it might have taken a bit longer when we started, but now that the code is working, we can updated data very, very fast. The colors chosen for each country are simply using our In Rainbows GetColor function. We’ve written about choosing colors plenty of times before and there are lots of ways we could have done this; In Rainbows, HLS World Map or something else entirely. As a first pass to make distinct colors this works like a charm. We’re happy with the final product, but you might be curious about how we make all those lines and curves in code. It certainly isn’t magic, and it is probably way easier than you might think. We’ve put all the code to make these to_from visualization on GitHub. There you will find the 02010 code as well as the 02014 example. If we look more closely at the code itself, you’ll see that it isn’t as complicated as you might expect. 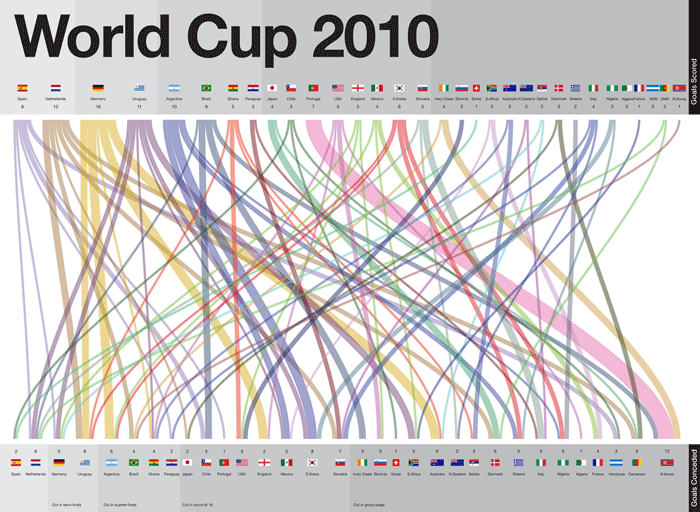 Using data from the 2014 world cup, this to_from chart visualizes the goals scored and goals conceeded for each team in the tournament. // Build-up an array of key=>array() mappings for each team and who they scored against. That’s it. If you have any questions, comments, thoughts or want to use this code in your own projects, please do. We’d love to see other examples as uses for this to_from visualization.